Oversized Statement Glasses are totally fun. The styles vary in terms of size, crazy colors, textures and unique curves. Nothing was as quirky and fancy as the OTT (over the top) embellished or decorative ones which have been my favorite so far. First things first! Get some cheap sunglasses. 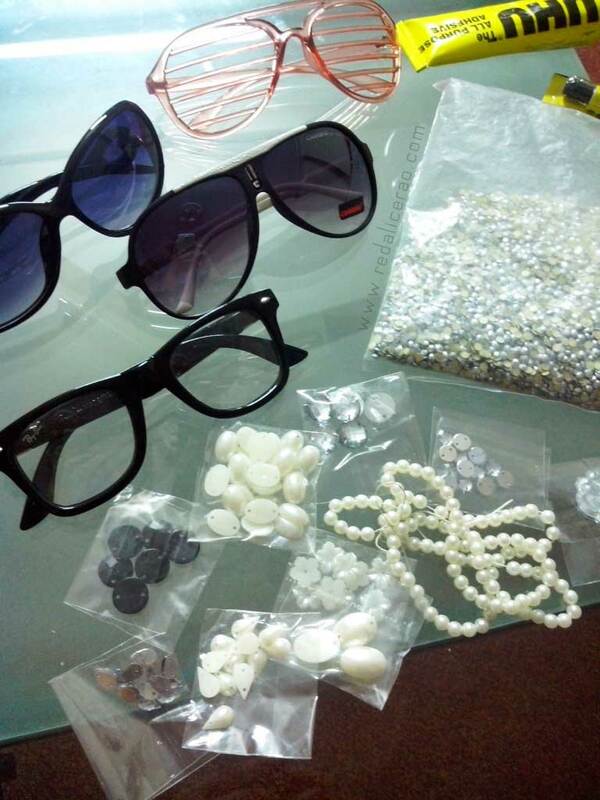 You definitely don’t want to mess up your branded sunnies for this glam experiment. You can get whatever shape or size you prefer or try out something new, choices are unlimited. The wilder, the better. 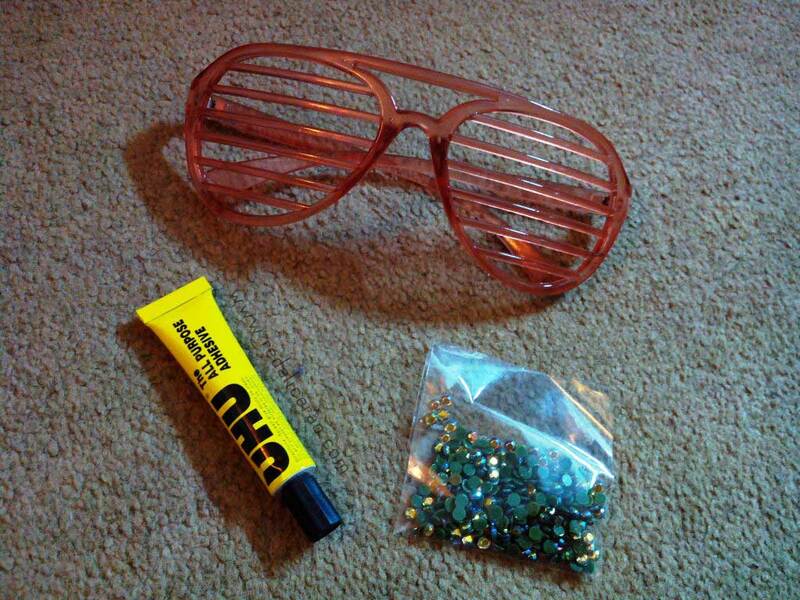 Make sure you clean the sunglasses before starting to decorate it. Now select your choice of embellishment. Initially I thought of spray painting them black first but I cancelled out that thought. 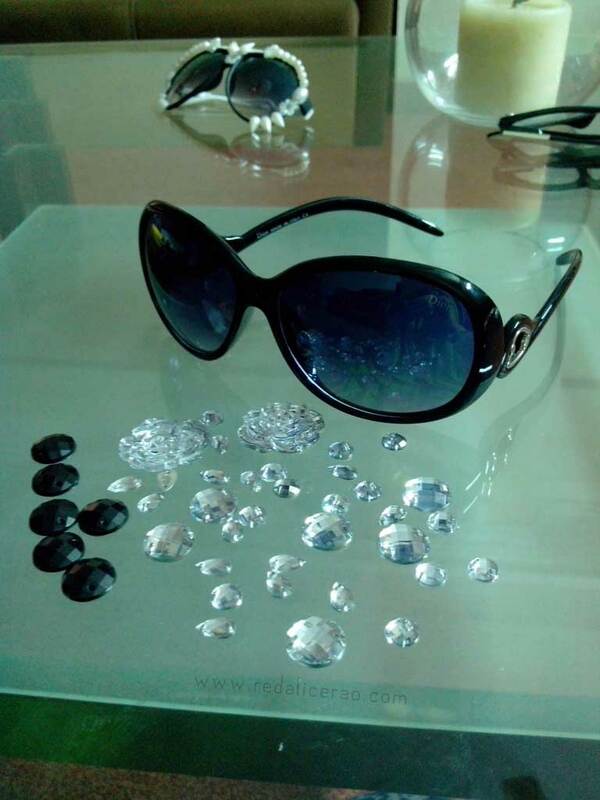 Instead I got stick-on diamantes in multi shade similar to that of the glasses. I started with applying glue on the horizontal lines (I chose every alternate line). The secret of using UHU Liquid glue properly is to apply it on the base, let it set for a few seconds and then stick the object/medium of choice on the base. 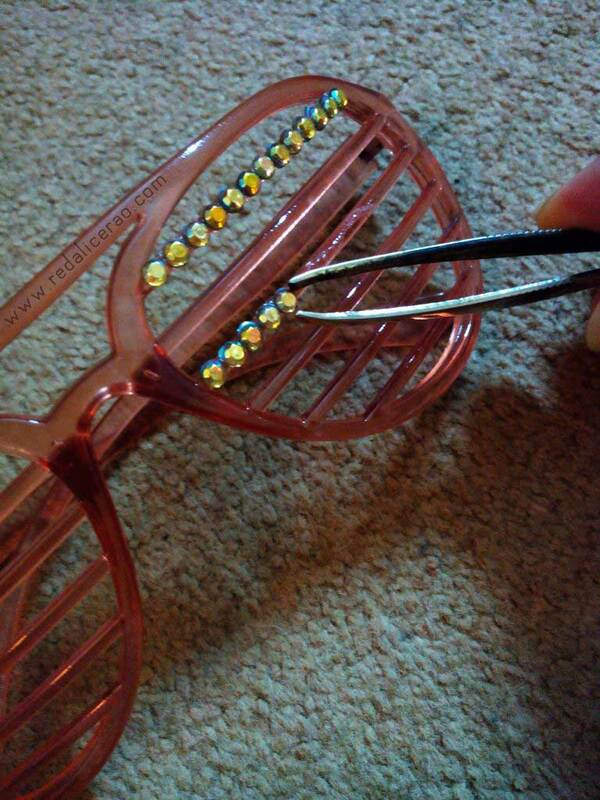 You can use tweezers to stick the diamantes or your hands if they are steady. I prefer using my hands more. 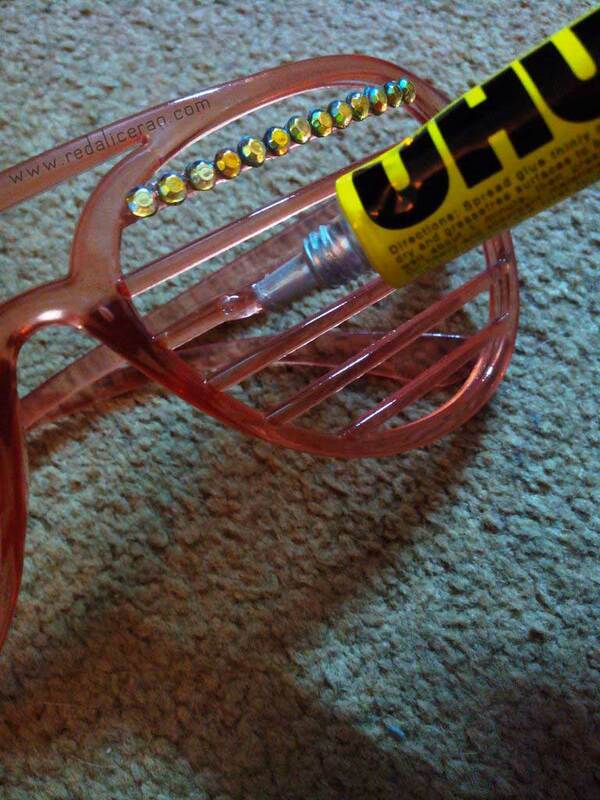 Keep applying UHU in sections and after it sets stick the diamantes as shown in the photo. Let the glue dry out overnight and the glasses are good to go by morning. I used UHU but for a long lasting finish you can use a glue gun. I wanted to make these for fun sake so didn’t use a Glue gun but I would have if I wanted something more durable. 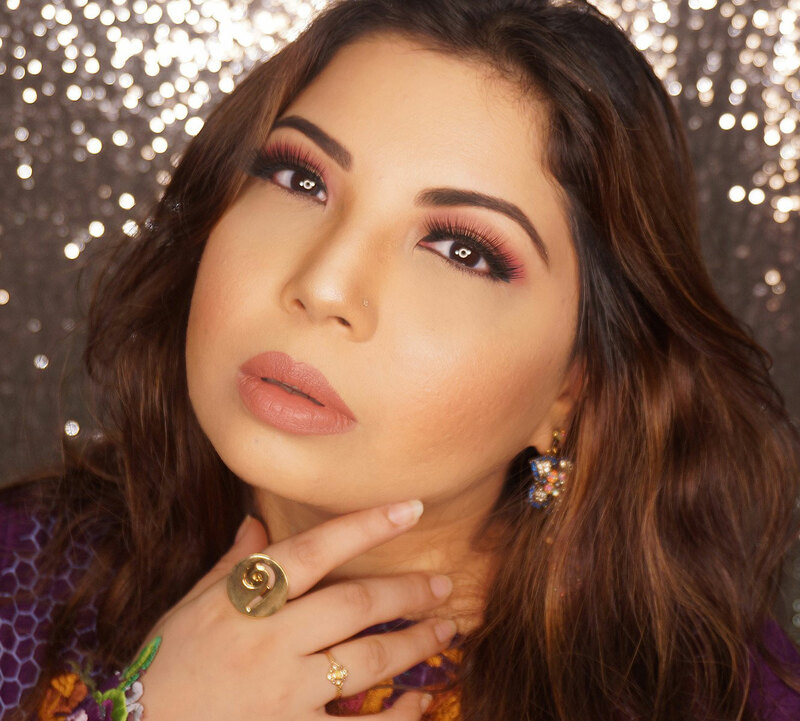 The Retro Glam look is basic and not too over the top and for those who want to give it a try but with baby steps. 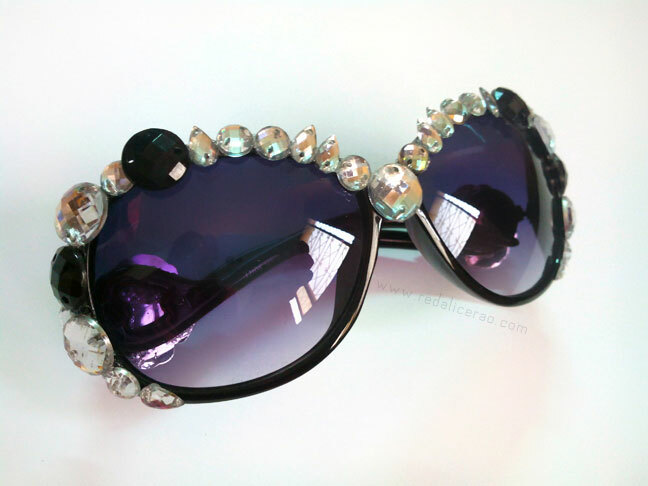 This may not be sunglasses but they make fashion fun! 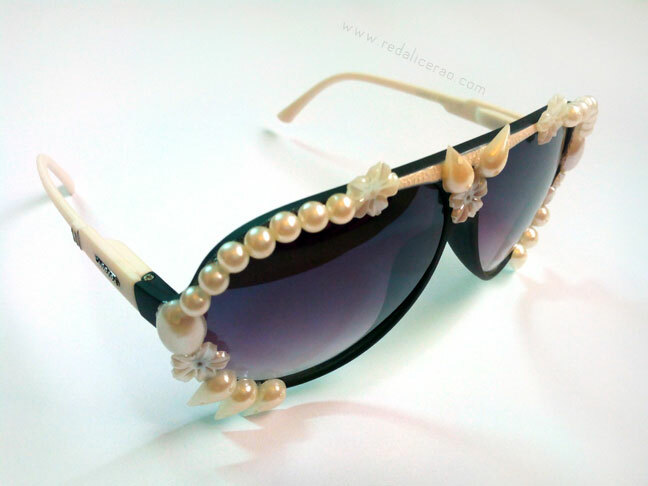 I created this one with plastic pearls, pearl finish droplet and flower beads. 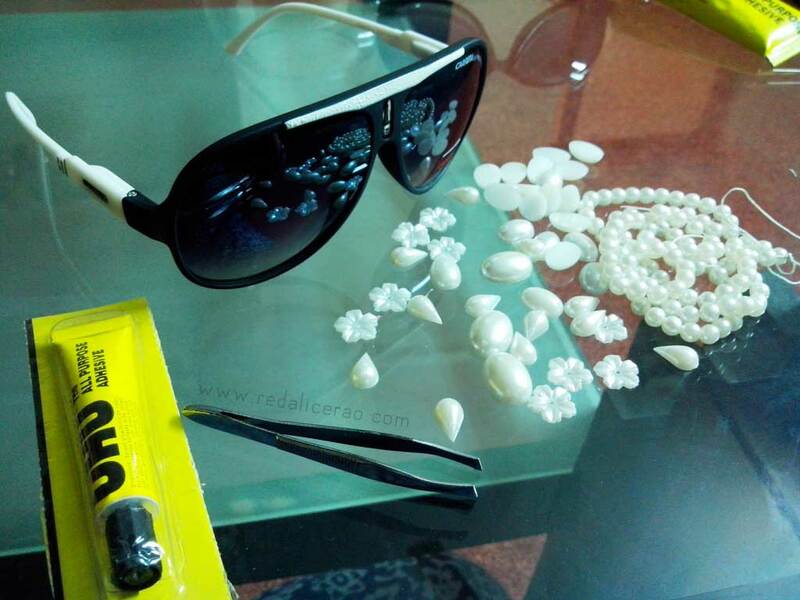 Apply a little UHU glue on the edges on the sunglasses where you will be sticking the beads. Let the glue set and press the bead gently on the glue. Creativity lies within you. You can play around with layering of the beads according to there shapes and position until you are satisfied with what you want. 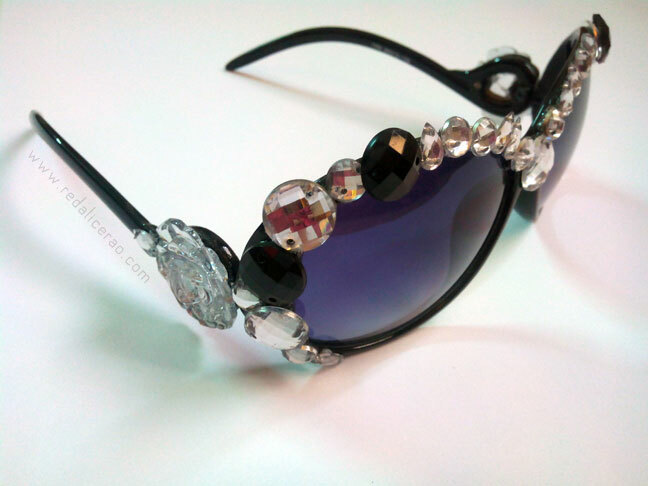 If you want you can actually place the beads before hand on a sketch of the sunglasses to pre decide visually. For this I used Plastic Crystal beads/buttons. The process is similar to the Boho Chic Pearly one. Apply glue on the edges and stick the beads as per design preference. I added a little extra glam by adding a flower button to both sides. A statement necklace? Sure. Some quirky earrings? Ofcourse. 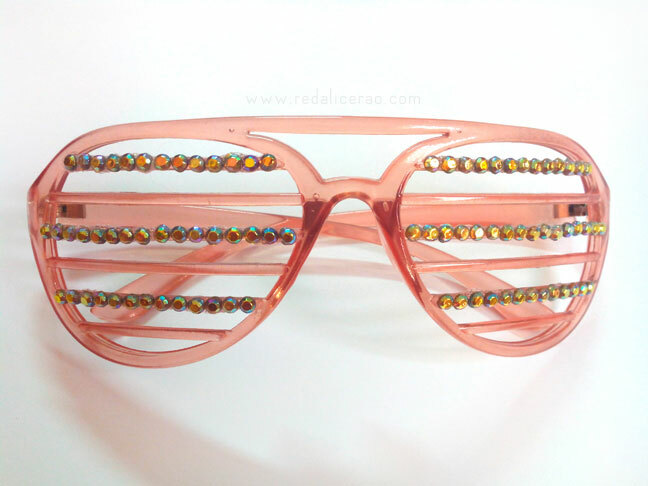 But nothing says I am bold and beautiful like making a statement through these Super Glam Glasses. 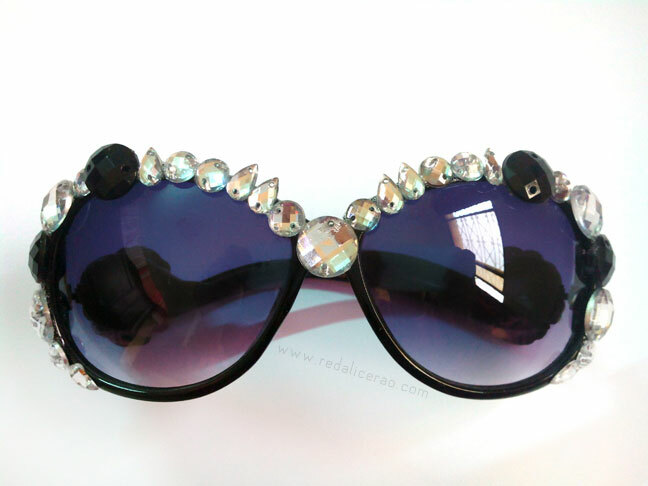 These fierce sunnies can make you go from Oh to Oh lala! Try these out. The choice of beads and embellishments is limitless and you can make one that’s just right for you. Super cute! I HAVE to try this! Love this DIY! I did something similar with small rhinestones and pearls, but you inspired be to do something more dramatic! I can't even choose a favorite - they all look amazing!! These are all so much fun. Some for parties, but other i can picture people actually wearing, like the last ones. 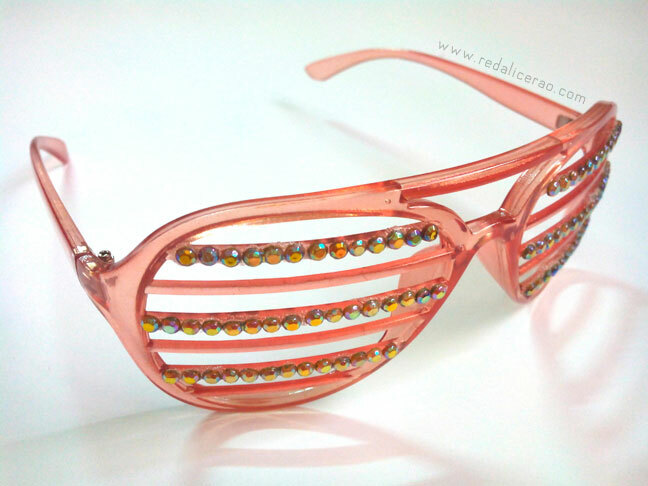 They remind me of a pair of Bulgari glasses I saw recently. All of these look super cool. 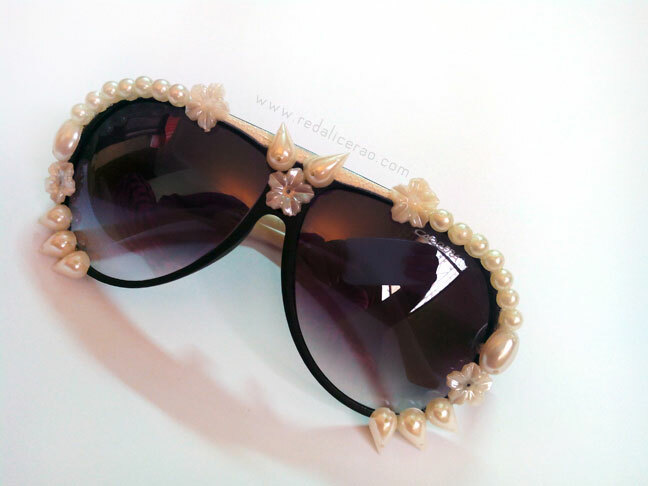 I definitely should do something with my old sunglasses too! This looks really easy and fun! Yours looks great! Do try it out Evey! Great and fun idea. 2nd and 3rd one are so chic and cool. I m In love with last piece.